Xiaomi launches the affordable Redmi Go Android Go based smartphone in India. 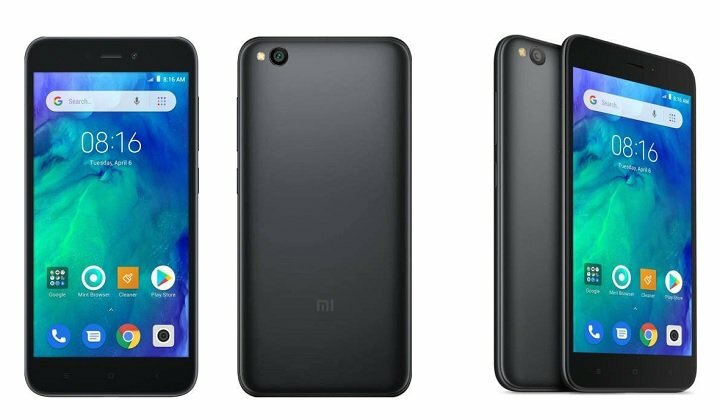 Home Xiaomi Xiaomi launches the affordable Redmi Go Android Go based smartphone in India. Earlier Xiaomi launched the first Android Go based smartphone with Redmi Go in Europe. Now the company has finally launched the Redmi Go in India. The new Redmi Go will arrive in two colors with Blue and Black. The device will be exclusive to Flipkart, Mi Home, and Mi.com and will go on sale from March 22. Redmi Go is priced at Rs.4499/- and comes with Rs.2200 cashback in the form of coupons along with 100GB of 4G data for Jio users. Redmi Go looks like Redmi 4 with thicker bezels in the front and all-metal unibody on the back. The new Redmi Go sports 5.0 inches HD standard 16:9 aspect ratio display with a resolution of 1280 x 720p. The new Redmi Go is powered by the SD425 SoC coupled with 1GB RAM and 8GB internal storage. The storage can be expanded via microSD card slot (Hybrid SIM slot). The new Redmi Go features an 8MP rear camera with an aperture of f/2.0 LED flash and 5MP selfie camera with an aperture of f/2.2. It measures 8.35 mm thick and weighs 137 grams. The connectivity option includes Dual SIM with 4G LTE and VoLTE support, Bluetooth 4.1, Wifi, A-GPS, GLONASS, micro USB port, and 3.5 mm audio jack. It runs on Android 8.1 Oreo Go OS and packs 3000 mAh battery. Previous articleSamsung launches the new Galaxy A20 with Infinity-V display in Russia and Galaxy A40 in Europe. Next articleGoogle announces the new cloud gaming service called Stadia ahead of GDC 2019.